I love being next to the ocean. It's life giving in so many ways. When I had a chance to visit the ocean, what was inspiring to me was watching how big it is. 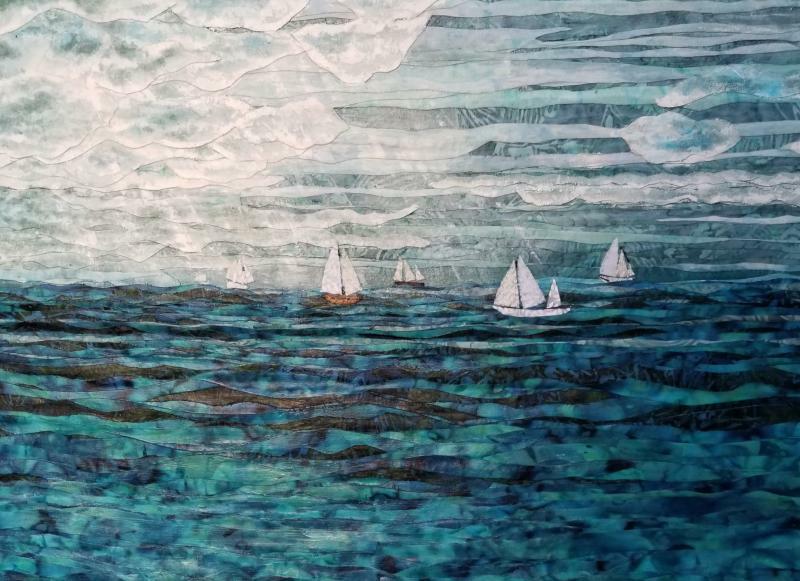 To see those waves drifting by in what seemed endless dance. Looking up into the sky where big soft clouds are drifting by. The whole scene there seemed to go on as far as I could see. It was one big symphony playing a life giving song. Being apart of all gave a presence that we are not alone. There is a lighted way. Do You Know Your Power? When I create, I listen to my thoughts as it gives me the next inspiration. 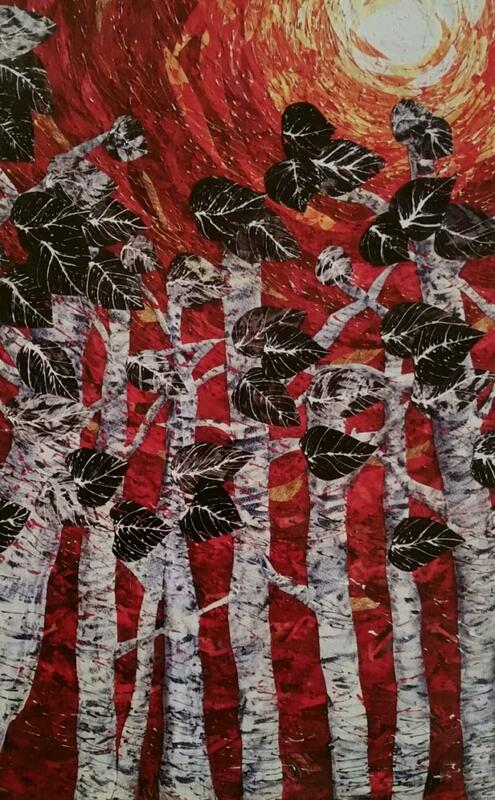 In this piece, I was transformed to a forest where the rushing wind whirled into colors of reds, very lovingly urging me into to understanding that we all are so much more powerful than we give ourselves credit for. Everything we say, think, and do is shaping our life and destiny. When I had this thought, this piece came out of me with a fiery sweet embrace. The whole time in creation, I thought to myself, “Do you know your power?” This canvas art piece came pouring out as if to say SEE ME. When you see it in person, you get this sense of motion and movement that I didn't anticipate. It's just beautiful! It was such a beautiful day visiting the Mc Nay museum. Seeing world famous works of art. Having a long conversation with a security guard that worked there, and couldn't wait to go to work everyday to be surrounded by all of this art. The whole day inspired me so much. When I went out doors, to visit the porch area, it gave me a minute to soak in the day. Just beautiful. This is the result. 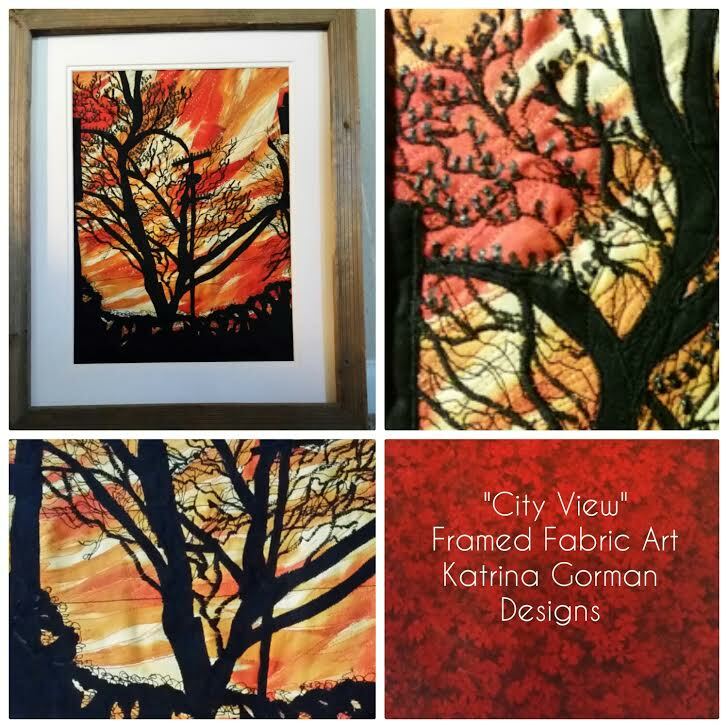 This fabric art piece that captured the beauty of the day in a moment in time. 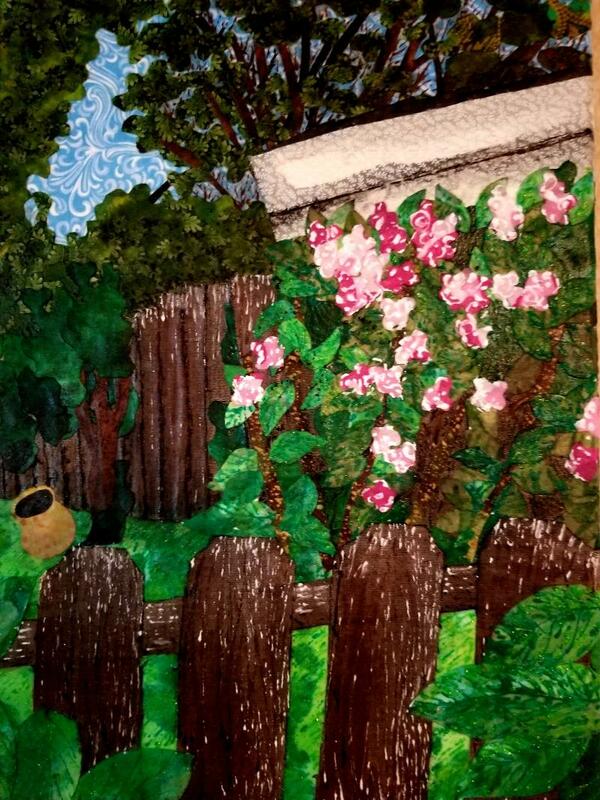 This is a fabric art piece that inspired me from those thoughts of sunny skies in Round Rock TX. Such a beautiful time spending the afternoon painting with a group of artists. Over across the way, a beautiful little cottage full of natures wonder that made me stop for a minute. Made me feel calm. 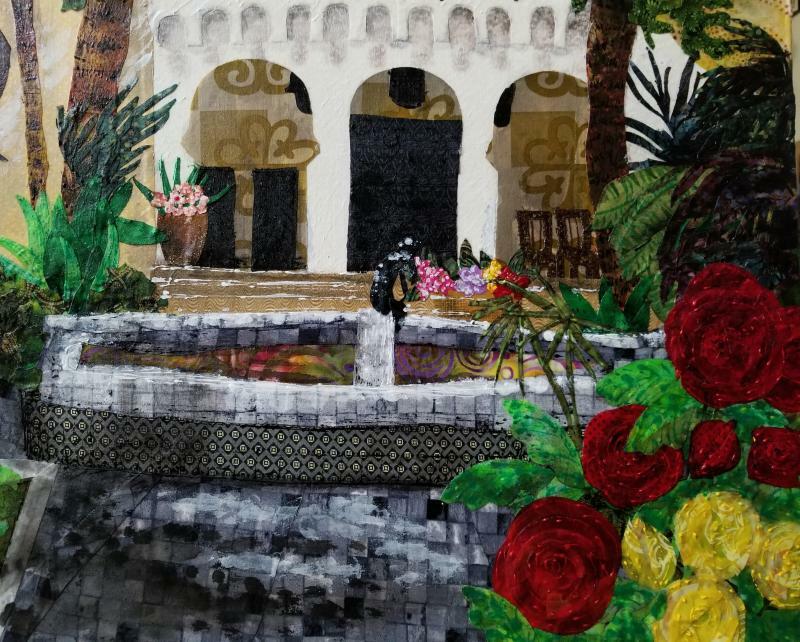 This fabric art was inspired by being in sunny San Antonio on an afternoon while a friend visited and we found something fun to do. Go down town to see the sites. It was a beautiful afternoon. And such an inspiring moment to soak in an friendly atmosphere filled with people, smells of cooking Churros and enjoying time spent together. 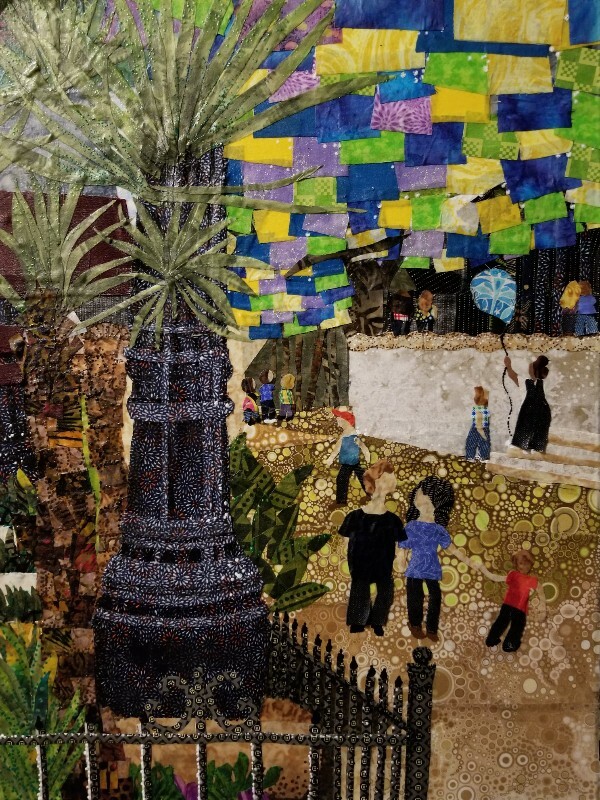 This piece has so many special moments in it by the international fabrics selected to the pointallism used around the palm trees. To the feeling of closeness that you get from viewing this piece is lovely in photos and really comes alive in person. This is the first art portrait that I've done of anyone in this size. 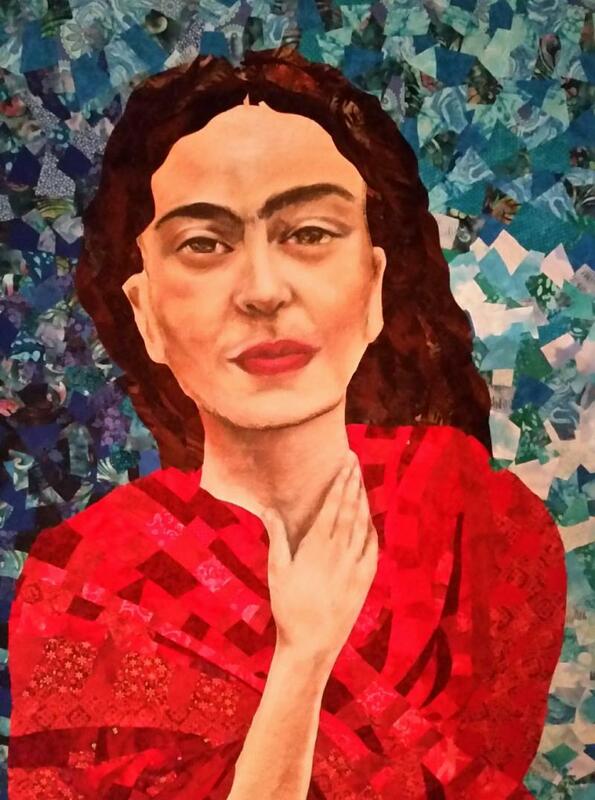 I knew it would be extra special, because it is of one of my favorite artists, Frida Kahlo. So interesting how she turned out. Originally, I was thinking the whole scene would be "traditional" Frida that you might have seen before. Flowers in her hair or in a powerful stance. But this piece took so many turns, as if she was guiding me on how she wanted her portrait to turn out. The whole experience was quite lovely, just listening along the way to see what turn happened next. When you see her in person, you'll see something extra special too. On the right side of this portrait are a series of doves that I didn't intend on putting into this piece, but appeared when I noticed them flying after it was finished. How interesting! She started pouring out of me in her creation. Believing those unseen forces are there, in our lives watching over us in protection and guidance. 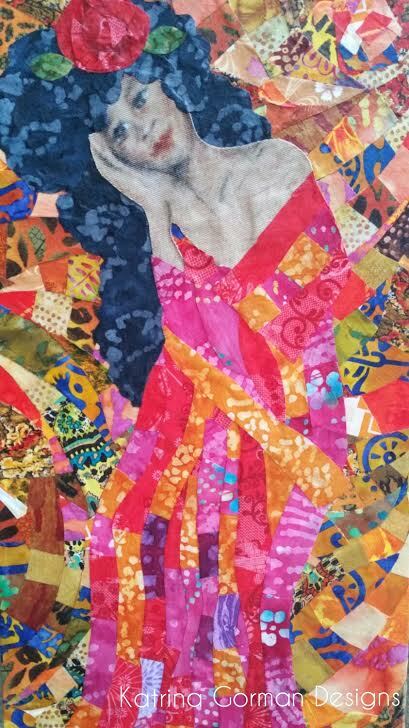 In this piece, she has such a thoughtful gaze about her. In this story she is giving the message as she kneels that sees her that everything is going to be alright. To surrender and let those forces guide you is the best way of fixing anything that might come up. 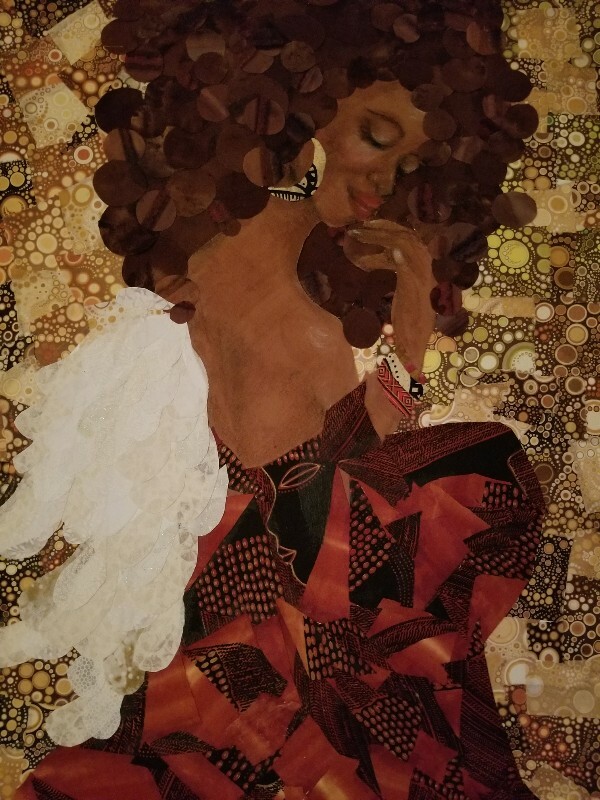 She was made with those beautiful pieces of fabric from Nigeria and some from Austin TX. such a thoughtful stare about her. Telling a story that everything is going to be alright. Sure gives alot of love. Ever look into the sky at one of those sunsets that you knew would be memorable to you? All the oranges and yellows made you feel like goodness, this is probably one of the most beautiful sunsets I’ve seen to date. Looking onto a silhouette of the city with the many houses around and trees around. Hundreds of black birds all around in every tree I saw, singing as I sat still watching the show. I had never seen so many birds before in one spot. Maybe they were migrating or having a party, I’m not sure. But it sure was beautiful to see and one of those moments where I sure needed that. Felt like a reassurance at the time that no matter what was going on in my world, everything would be alright. Seeing the world in a fresh pair of eyes. Understanding the more you see and are aware of what is going on around you, the more "Awake" you become. This is the inspiration for this piece. The colors are so vibrant and bright. Sure to bring a beautiful new energy to any surroundings. ﻿I was fortunate to be apart of an art exhibit in South Carolina where the theme was expressing art from a tragedy. People where having church services and a man came in and took there lives. It gave me such a whirl wind of emotion! Ultimately, I came to this conclusion. I really don't know if we know ahead of time how we leave this world but I do know there is this divine energy there with us, to give all the love and comfort we need. 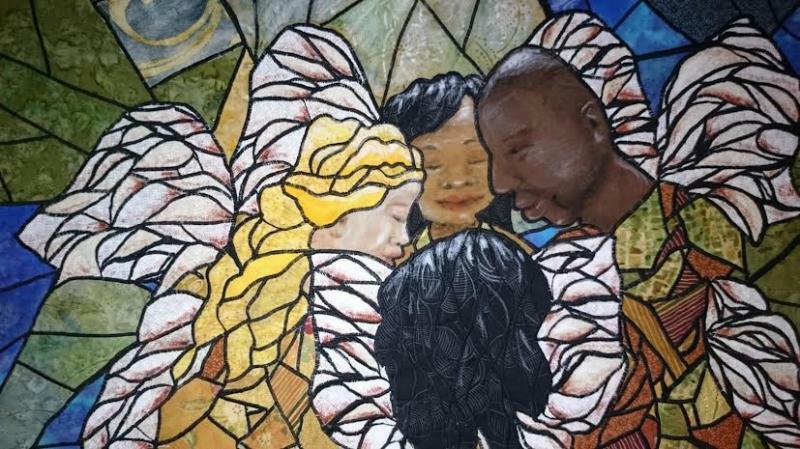 Calling All Angels is a piece made in love to represent strength and love knowing we are never alone. Created: 2016 Size: 24" x 48"
When I started to recieve the inspiration for this piece. I would hear the message from the inside, "You Are So Loved." Then as I was going about my day for the next several weeks, I would see a bumper sticker that said, "You Are So Loved," or a banner on a billboard and as this thought kept coming to me in outward ways, I knew I wanted to express this sentiment in a beautiful way. 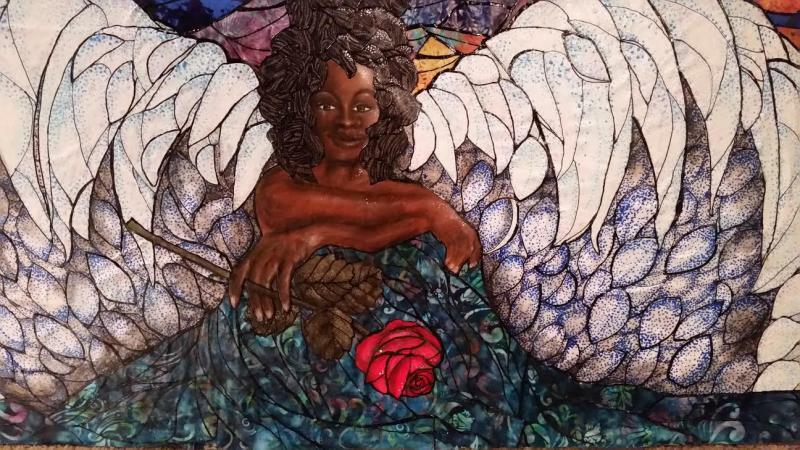 I saw this image of an angel, with adornment in her eyes giving me the feeling that she is here with me, and always has been saying, "You Are So Loved." I layered fabric on top of fabric and used a pointallism technique to enhance her leaf like wings. Her face was completed using pastels to give a soft loving appeal. For a couple weeks before I had this inspiration, my spirit repeated to me that the “Eye is on the Sparrow” Different happenings confirmed to me that this was my next inspiration! I heard this song playing over and over, even flipped through the channels on tv to hear a minister talking about this subject. 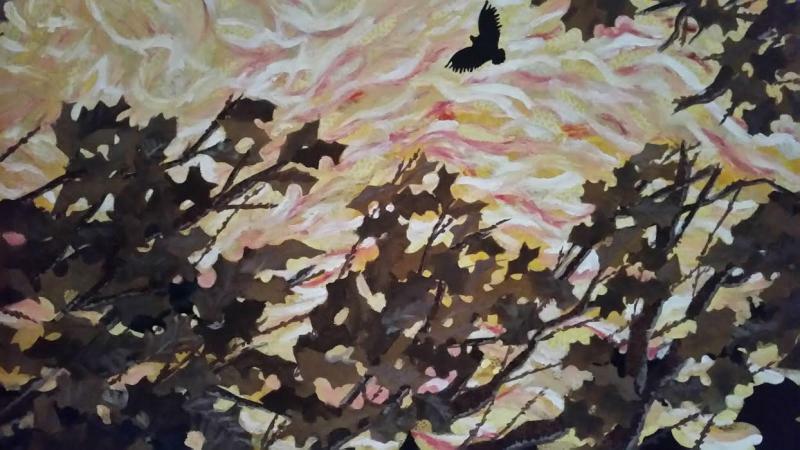 As this piece evolved, it’s like I could feel myself being transformed to a place where I’m standing on the ground, looking up through the trees to see this bird flying through the evening sky feeling at peace. I love the colors in this one! Makes me feel calm.